It seems like you can’t go a week without reading a story about a student who has decided to bring a Confederate flag to school or wear clothing with the symbol prominently displayed. Over the past few years the number of reported stories has increased in frequency. More interesting, these incidents have spread well beyond the South to every region of the country. While these stories make for great press what is usually ignored is how individual schools end up dealing with the fallout. While the courts have ruled consistently that school administrators have the right to limit the display of the flag that can do little to assuage the uneasiness and mistrust that is present in the hallways. In February I will deliver my first talk on the history and evolving meaning of the Confederate flag in front of an entire high school community. This talk is not designed to tell students, teachers and administrators what to think about this potentially explosive issue, but to provide a framework for those who are interested in reflecting on this subject in a more constructive manner. I provide a history of how the flag has been interpreted and used in the past by different groups and engage students by asking them to share their own perceptions about the meaning of the flag and why this symbol continues to divide communities. Regardless of what students believe about the Confederate flag their thinking should be informed by some understanding of the relevant history. While the temptation for administrators and teachers may be to move forward following these incidents as quickly as possible, it is safe to say that the underlying questions and tension will continue to fester. There are a number of approaches that I can take in discussing this subject with your school community. Regardless of the approach, a presentation on the history and current controversy surrounding the place of the Confederate flags in schools offers a school community an ideal case study with which to explore conflict resolution. For that reason alone, this talk is also appropriate for schools that are not currently dealing directly with these controversial questions. Beyond the schools, this talk also can assist communities that are struggling with the display of the Confederate flag in public places. I approach this subject and presentation with the basic assumption that regardless of what you believe, know your history. As you know, when the Confederate flag was displayed at my son’s alma mater it was immediately confiscated by a teacher and the students were subsequently expelled. Because the hateful incident occurred at a Catholic school, action was swift and public. The school was supported by the community and its academic family. I remember this story. I would love to know if the school did anything to educate them on the history of the Confederate flag and why it is still controversial. Perfect audience for me. 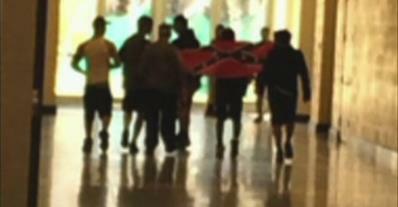 “a small number of students decided to use and display a symbol of hate. The symbol, namely the Confederate flag, carries a message that most, if not all Americans, view clearly as a reminder of a painful past where our country went to war, resulting in over 600,000 killed and, thank God, the end of slavery. The use of any symbol, either historic or current, which carries a meaning designed to revive past injustices or to inflame discrimination or racial intolerance is completely unacceptable and profoundly offensive. …As a Catholic and Franciscan school, Saint Anthony’s will always demand acceptance and respect for all races, religions and cultures. Many pro-CBF blogs called Brother Gary a “Liberal”. He certainly is not. No doubt, it is a well-intended letter, but it seems to me that schools need to go further. As you well know, the flag has a much longer and complicated history. It would be interesting to know what the students who were expelled know about this history. Of course, the other issue that can be explored is the intersection of free speech, history, the need to maintain community in various institutions of learning. This subject can serve as a very useful case study. The Confederate flag is a symbol of heritage as well as disobedience against injustice and tyranny. The school got this wrong and inappropriately punished these students. For many it is and for others it means something entirely different. You can take all the image captions you want. You are a guest on this site and commenting is a privilege and not a right. If I deem your comment to be inappropriate for whatever reason it is deleted. End of story. Please explain using facts and primary sources from before 1862 where the US was a tyrannical government to the southern states. Do the same for injustice. Show us where the federal government was tyrannical and oppressive. If you cannot do that, then shut up and quit lying to people. I am ending this thread right here. We’ve been over this time and time again on other posts. Thanks for your understanding. Kevin-I think all of your options are valid approaches and, which one works, would, IMHO, depend on the school and the nature of the problem. Maybe it’s the retired labor law attorney in me, but I think, in most cases, it’s essential, before punishing people for violations, that the rule and the consequences for its violation should be made communicated to them. There may be cases where investigation makes it clear that the student knew the potential for disruption and that’s why he/she/they did it. However, education helps prevent violations that occur due to ignorance. Jack, as Kevin notes, the symbolic meanings you cite are NOT the only ones. The fact that we are dealing with schools means that the potential of the symbol to disrupt the school environment is a critical issue. Maybe it’s the retired labor law attorney in me, but I think, in most cases, it’s essential, before punishing people for violations, that the rule and the consequences for its violation should be made communicated to them. The educator in me agrees entirely. As difficult as it seems these are learning opportunities and arguably some of the most important. I get the sense that all these schools are doing is pushing the problem away and hoping that it doesn’t resurface. I disagree. St. Anthony’s sent a clear message that students of color are welcome and that symbols of racial exclusion are not. As a parent who sent a tuition check there for four years I applaud that. No disagreement there, but did St. Anthony’s use the occasion to educate their students about why the flag is so divisive? Beyond a brief statement I didn’t see much of anything. It’s an opportunity for a discussion and it’s just the kind of thing that I think I can help with. Pat-I agree with Kevin. It doesn’t mean that either Kevin or I oppose punishing the students but it does mean making the punishment fit the crime. If an investigation shows that the student(s) knew or should have known about how disturbing this would be for other students and that is why they did it, then the student(s) should be punished as the school deemed fit. However, unless everyone in the school already knew about the significance of the “Confederate flag”, administrators and teachers can use this as an opportunity to educate and not just have students dismiss this as the adults being arbitrary. However, unless everyone in the school already knew about the significance of the “Confederate flag”, administrators and teachers can use this as an opportunity to educate and not just have students dismiss this as the adults being arbitrary. I agree, but there is more at stake here. Kicking the students out without taking any steps to explore the subject in an educational manner has the potential to create mistrust between students and teachers/admininistration. I don’t think there are a lot of Long Islanders who are ignorant of the meaning of the Confederate flag for black students. There are no Civil War battlefields near here. CBF means “blacks out” when displayed here. What history do you consider relevant here? It seems to me that regardless of what the Confederate flag may have signified during the Civil War, its current meaning can be seen in its use in Little Rock in 1957 and in resistance to desegregation from then on. I don’t think I’ve ever disagreed with anything Kevin has written before, but I think Pat Young is right about the St Anthony’s School case. Some questions have to be taken as settled, and what the CBF signifies today is one of them. You can’t go on always saying of kids who bring in the CBF ” it’s not their fault, they don’t know what it means”. The incumbent assumption must be that they know what they are doing and intend the foreseeable consequences of their actions. There is room for disagreement regarding how schools handle these cases. They are charged with the safety of the entire school community and ensuring that the environment is one where learning can take place. I see these cases as opportunities to begin a conversation – one that is rooted in history. I would like to think that as an educator and historian I can help with that. Thanks for the comment.